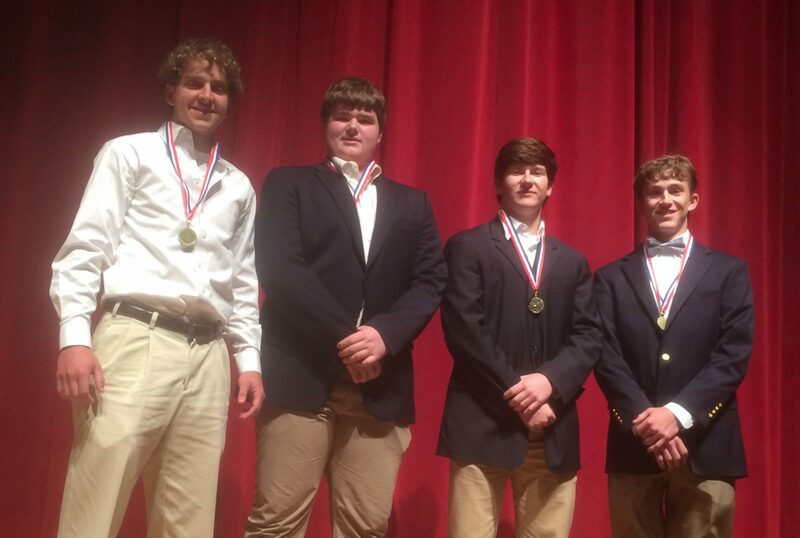 The Westwood Literary Team placed second out of 31 teams competing in the GISA State Literary Meet held Tuesday, March 14th at Valdosta State University. The Wildcats earned a total of 38 points in the competition, and finished just behind Piedmont School who scored 40. Zach Howell, a sophomore, was state individual champion in the personal essay category. His essay, entitled Change, was well received. “Your fight and struggle analogies created such vividness,” along with “great reflections,” were comments given by judges. The Westwood Quartet also received an individual state title in the meet. Members are: Brock Allen, first tenor, Gambill Dallas, second tenor, John Davis, baritone, and Patrick Vereen, bass. Their selections of Go Tell Aunt Rhodie and Nothin’ Like a Dame were well-received by both the audience and the judges of the event. Individual state runners-up included Elizabeth Glass in Rhetorical Essay and Fletcher Sheffield in International Extemporaneous Speaking. The Trio placed third in the state meet with their presentation of Ally Bally Bee and Camptown Races. Members are Kathryn Santos, Cassidy Trebony, and Darrah Butler. Senior Akshay Patel placed third in the Argumentative Essay competition with his essay on the Electoral College. Mary Kate Dallas and Karsyn West earned fourth place honors in the Duo Interpretation category at the state meet with their piece entitled Air Freida. 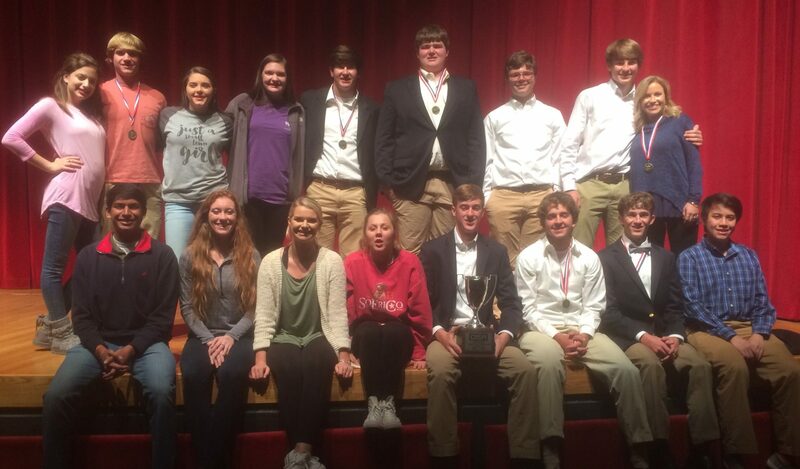 In the Region 3AA Literary Meet, held on Friday, March 10th at Abraham Baldwin Agricultural College, the Wildcats walked away with the championship. Westwood finished the Region Meet with a total of 76 points, followed by Crisp Academy with 53 points and SGA with 42. The Wildcats won seven events at the Region 3AA meet. Individual Region Champions for Westwood were: Kathryn Santos, Girls Solo, Elizabeth Glass, Rhetorical Essay, Sydney Lamberth, Dramatic Interpretation, Fletcher Sheffield, Extemporaneous Speaking, along with the above-mentioned Trio and Quartet. Five events earned runner-up honors at the Region meet. Runner-up at the region level were: Patrick Vereen, boys solo, Mary Kate Dallas & Karsyn West, Duo Interpretation, Akshay Patel, Argumentative Essay, Zach Howell, Personal Essay, and Phen Rubendall, piano. Third place winners at region were Cole Smith, Domestic Extemporaneous Speaking and Phen Rubendall, spelling. The Westwood Literary Team sponsor is Azalee Vereen. Musical instruction for the team is provided by Lynette Harper. 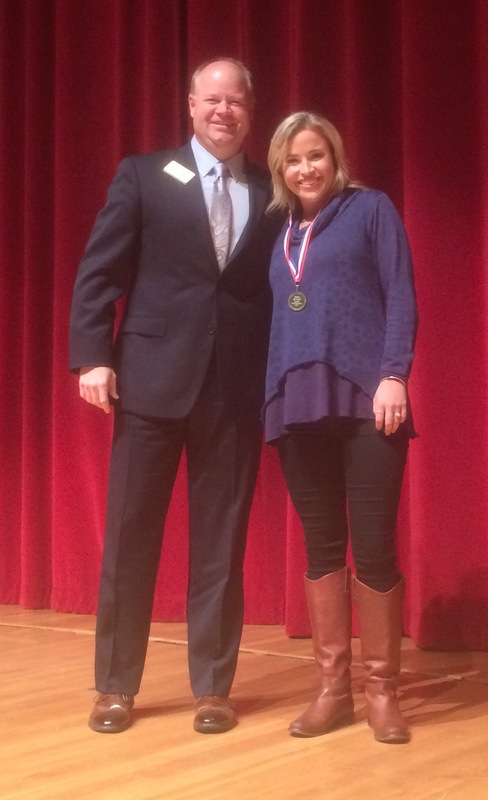 Sydney Lamberth, three-time state champion in Interpretation is pictured with GISA President, Dr. Jeff Jeffords. Sydney won the title for her portrayal of a young girl with cerebral palsy from the book “Out of My Mind,” by Sharon Draper. Zach Howell, State Champion in Personal Essay. Zach wrote an essay entitled Change, where he discussed how he could best change himself. Zach is a sophomore at Westwood, and is also the quarterback of the Wildcat football team. The Westwood Quartet also received an individual state title at the 2017 GISA State Literary Meet. Members are: Brock Allen, first tenor, Gambill Dallas, second tenor, John Davis, baritone, and Patrick Vereen, bass. Their selections of Go Tell Aunt Rhodie and Nothin’ Like a Dame were well-received by both the audience and the judges of the event. Westwood Literary Team – State Runner Up and Region 3AA Champions are pictured below. Front row, seated from left, Akshay Patel, Elizabeth Glass, Mary Kate Dallas, Karsyn West, Mark Glass, Patrick Vereen, Brock Allen, and Jason Pham. Second Row, standing, from left, Cassidy Trebony, Zach Howell, Kathryn Santos, Darrah Butler, Gambill Dallas, John Davis, Phen Rubendall, Fletcher Sheffield, and Sydney Lamberth.